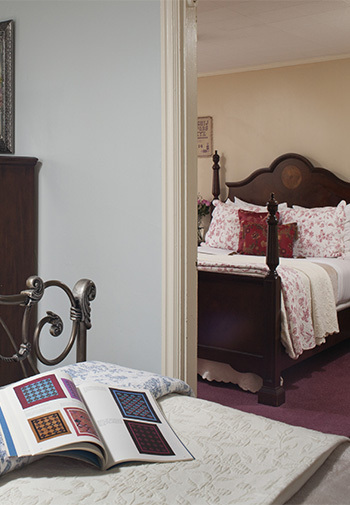 Reserve the Hayes Room at Carlisle House Bed and Breakfast, and spend time exploring Pennsylvania’s Amish Country. Two queen beds in separate room and a private bathroom with four-foot shower make this guestroom the perfect lodging for friends or family traveling together. Carlisle, PA is conveniently located near Ronks, Lancaster, Newville, and Newburg, so there is plenty of opportunity to experience the area during your stay. Double Occupancy rates for this room vary from $169 to $239, according to the season. Up to 2 additional guests can be accommodated at $25 to $35 per guest, according to the season. If you prefer not to book online, please call us at 717-249-0350 or email us at Info@TheCarlisleHouse.com. The Hayes Suite, is located on the 2nd floor at the rear. Hayes has two cozy bedrooms with a connecting door, and a private bathroom with large enclosed shower with corner seat, and European-style vanity. Each room has cable TV with a Blu-Ray DVD player. 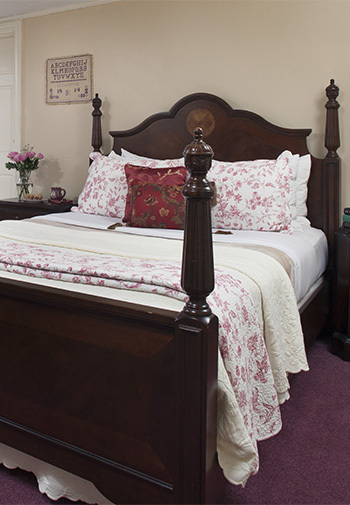 The first room opens to soft mauve carpet and a burl wood four-poster queen bed enhanced by elegant Raymond Waites “Savanah Garden” floral blue bedding and has a work table with Ethernet or wireless connection. The adjacent Sterling blue bedroom features a fluted iron queen bed with decadent bedding and acorn brown carpet giving a luxurious warm glow to the room.